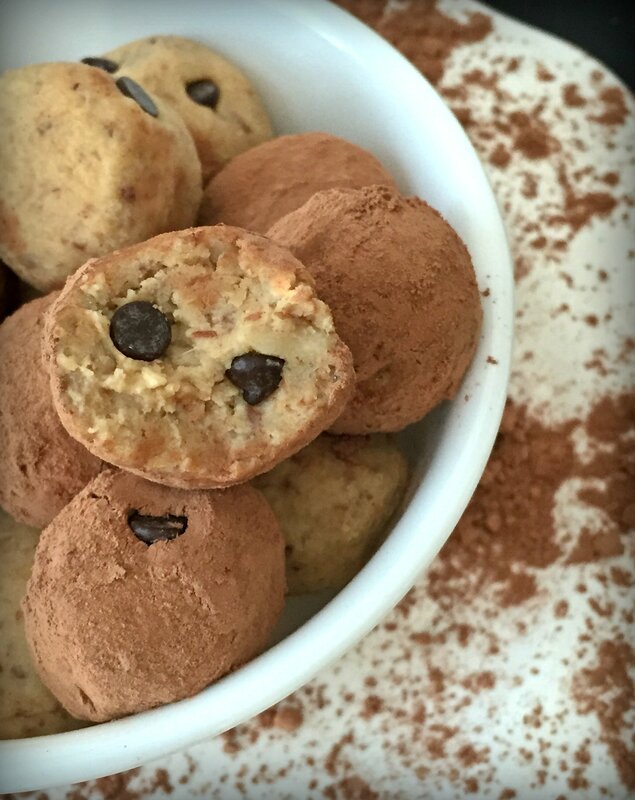 These protein bites taste JUST like oooey-gooey cookie dough and are an excellent balance of protein, fat, and carbohydrates, particularly as a pre or post workout snack. Simply enjoy 2-3 bites before or after your workout or as your mid-afternoon or post dinner snack to keep your blood sugar stable while satisfying your sweet tooth. Soak cashews in a small bowl for 20-25 minutes. Add all ingredients (cashews – salt) to a food processor and blend until completely smooth. The dough will be thick, but add extra milk 1 tsp at a time if needed. If using mini chocolate chips, transfer dough to a bowl, add chocolate chips, and stir until evenly incorporated. Form dough into 16 balls measuring about 1 tablespoon each. Roll each ball in cocoa powder if desired. Place on a cookie sheet lined with wax paper and chill for 20-25 minutes until set.